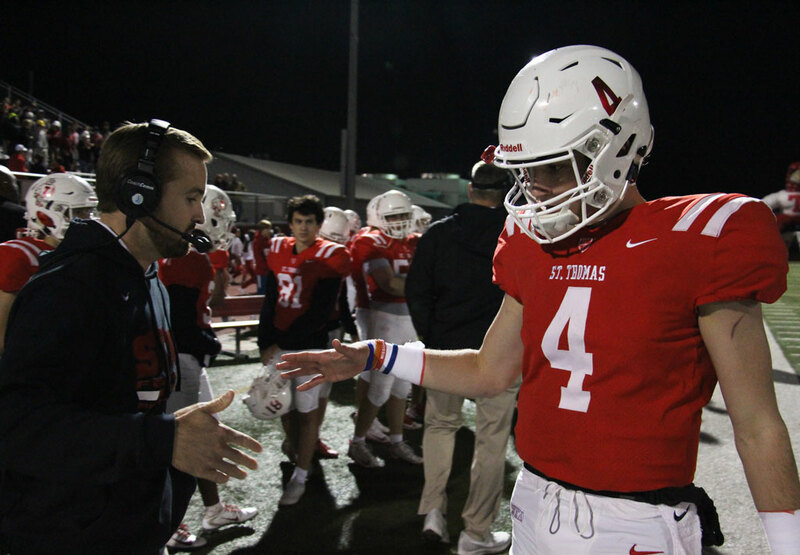 Quarterback Peyton Matocha ‘19 threw for 358 yards with three touchdowns and ran for a fourth in a record-smashing performance while Ian Wheeler ‘19 added two more scores as the Eagles enjoyed another sizzling scoring spree for their fifth consecutive win and first playoff victory since 2015. 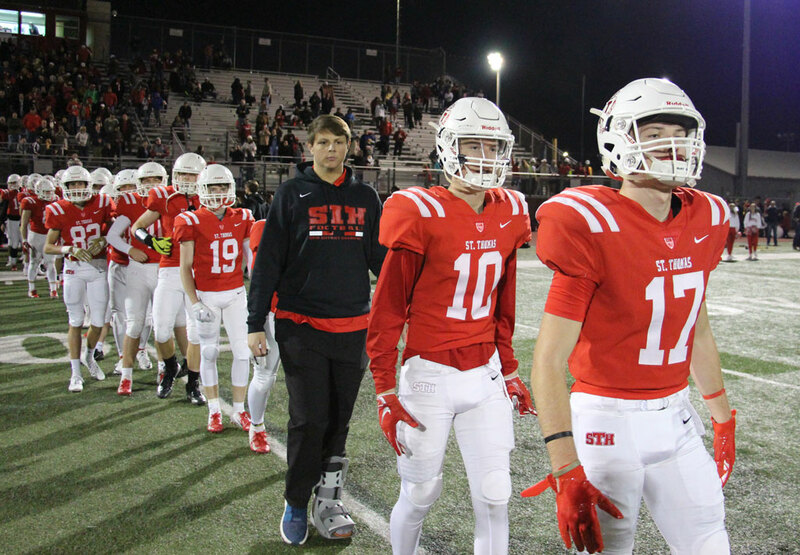 St. Thomas now advances to the state quarterfinals against Dallas Bishop Lynch scheduled for Saturday, November 24 at 2:00 p.m. in Fairfield. The Eagles twice built three-touchdown spreads in the first half after Josh Madden ‘19 returned a first-quarter interception 46 yards for a 21-7 advantage. 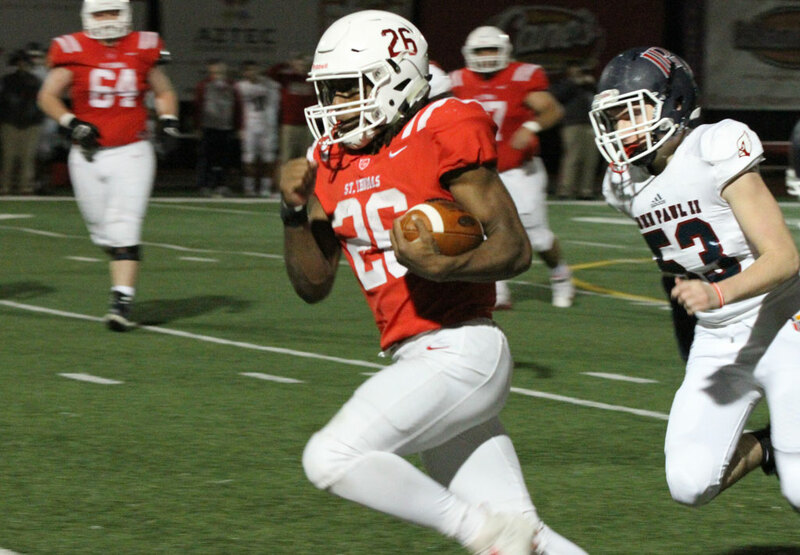 On the first series out of halftime, the Eagles churned nearly half the third quarter clock with Matocha finding Jordan Augustine ‘21 on a quick-striking slant route for a 21-yard score to take command 42-25. 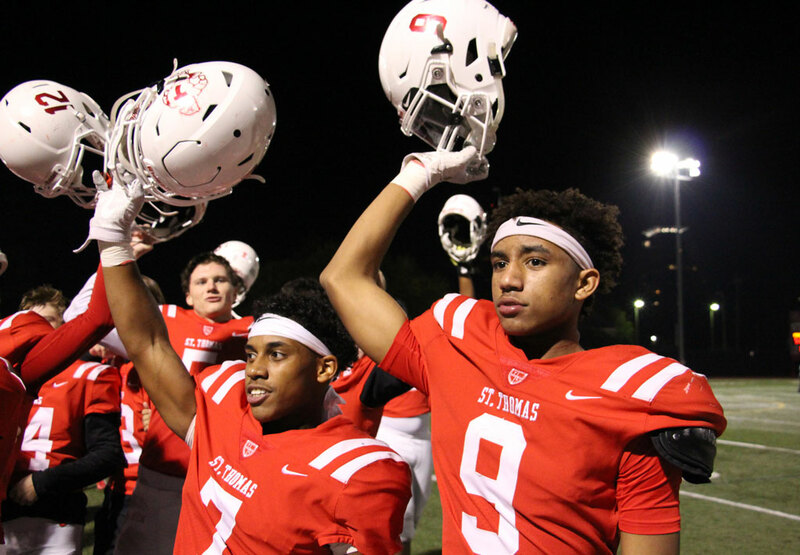 St. Thomas had comfortable control the remaining 19 minutes of the game. The Eagles are pummeling defenses like few teams. With ease. With poise. With confidence. With flamboyance. Matocha has flashed spectacularly throughout his third consecutive starting season with size, calm, arm strength and mobility. 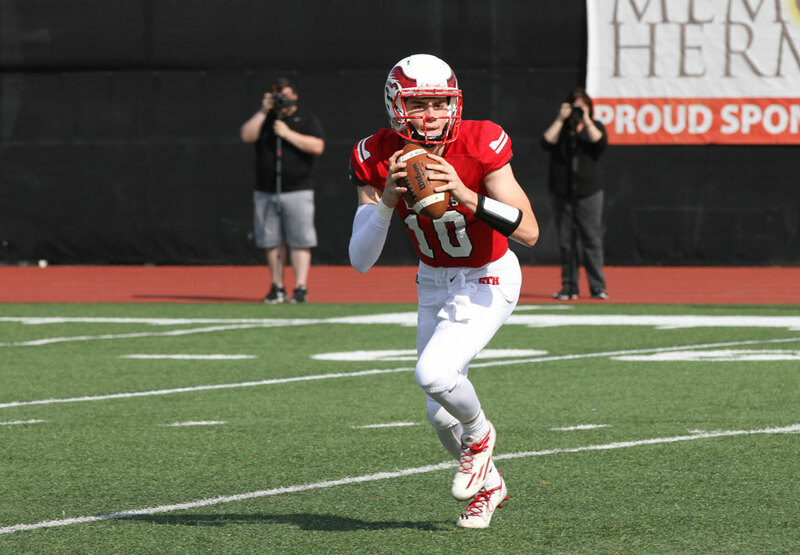 He was near-perfect completing 21-25 while setting the single-season school record for passing yards with 3,371. 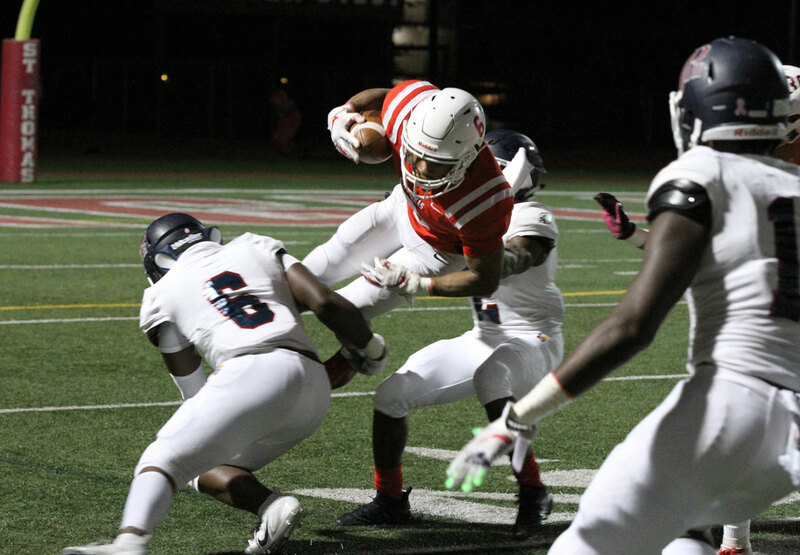 Surrounded by an assorted ensemble of lethal weapons the offensive wrecking crew surpassed the 50-point barrier in consecutive games and is averaging more than 40 points per during the second half of the season (after racking 58 and 63 in Weeks 2 and 3). The latest carnage left John Paul washed up as if clutching a FedEx package and talking to a blood-smeared volleyball. For the second half of the season, Wheeler has proven harder to tackle than Social Security reform. 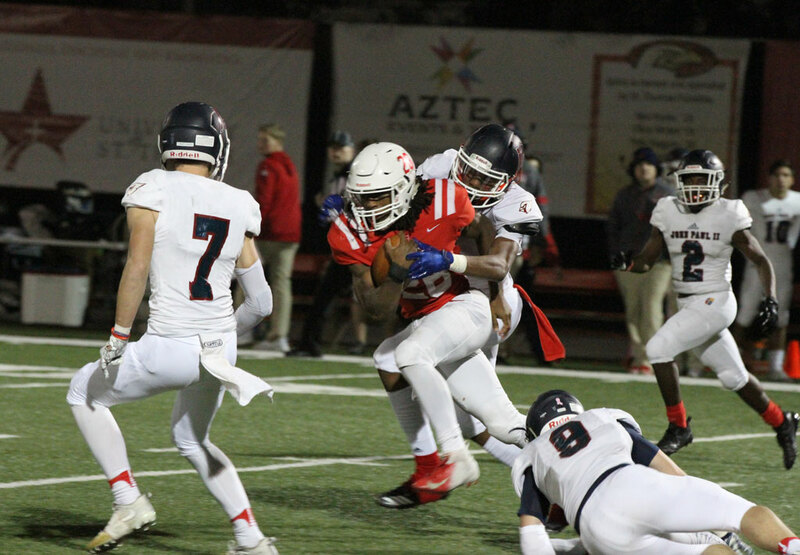 Early in the second period, he crashed through the left side untouched from short range to cap a 65-yard march to push the St. Thomas edge to 35-14. He later banged on six straight snaps and the final 42 steps for his 15th rushing touchdown to stack the final 52-32 count. 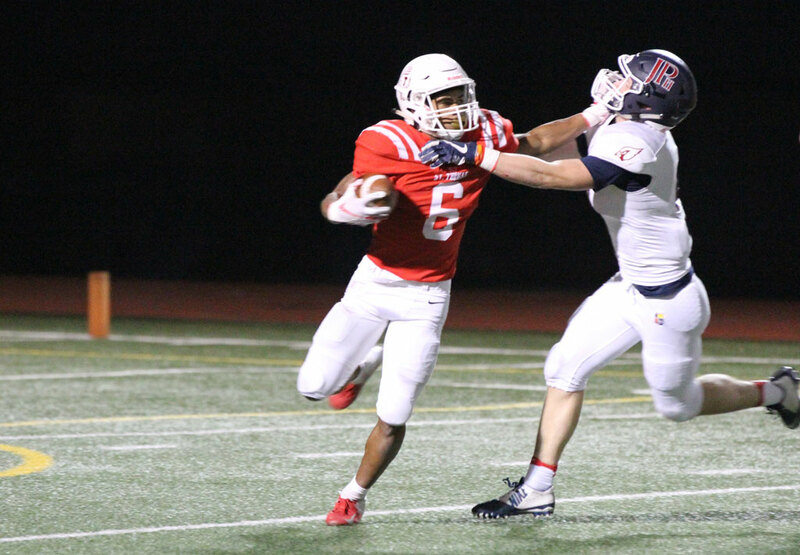 The National Honor Society member gashed JPII for 196 yards on 24 carries to raise his senior sultan of smash and dash season total to 1,266, tops in TAPPS D-I. The Eagles were shaky at the start, allowing a touchdown drive on the game’s first series and surrendering strip fumbles on their first two possessions. 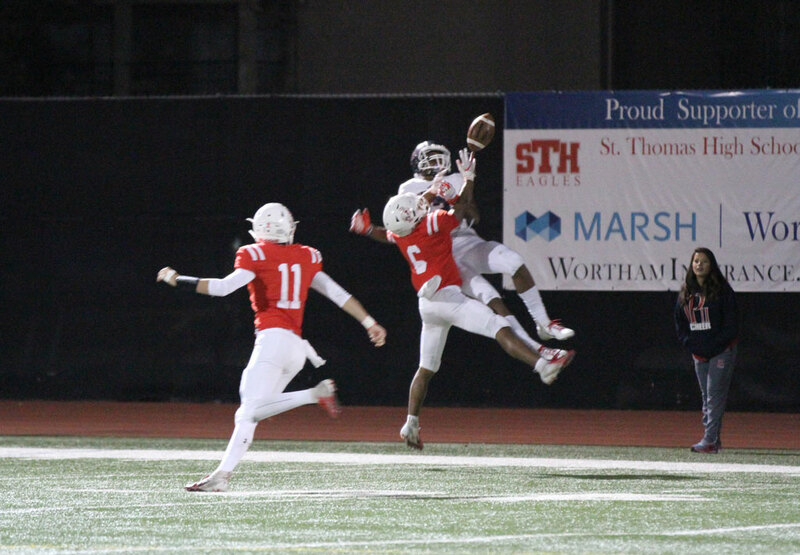 With John Paul driving to gain a double-digit margin, Jamal Jenkins ‘19 gave the Eagles a much-needed jolt, flipping momentum with an interception in St. Thomas territory. Unnecessary roughness was whistled on the return and the Eagles also benefited from a pair of unsportsmanlike penalties. The severe swing in field position left the Eagles at the John Paul 14-yard line. 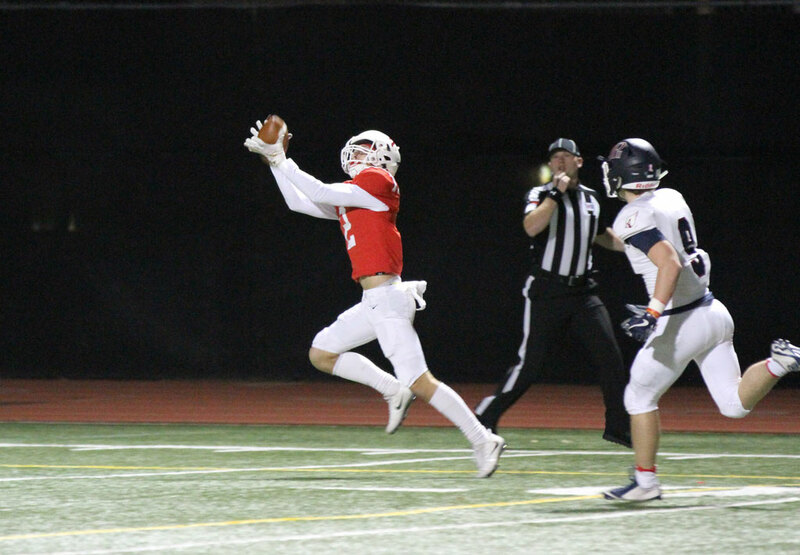 Matocha needed only two snaps to put up points and then followed on the next series with a 46-yard scoring payoff to receiver Hunter Cheek ‘19. 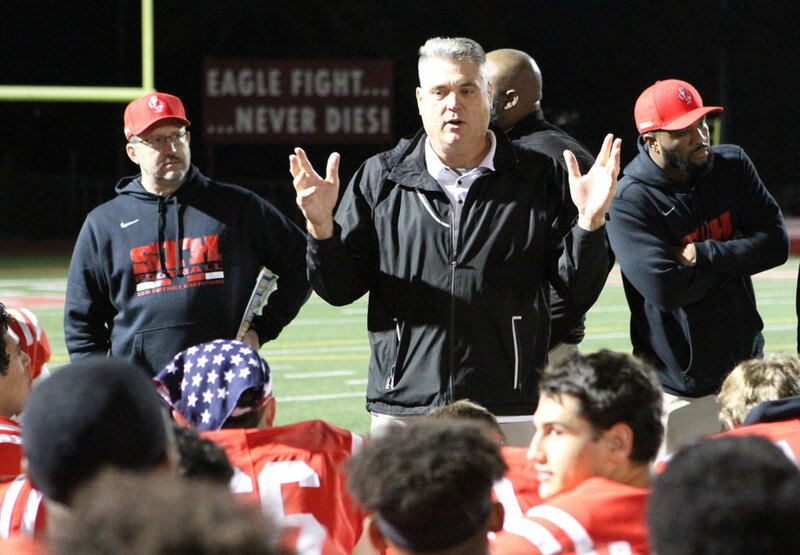 Eagle Football had found its groove and never trailed the rest of the game. 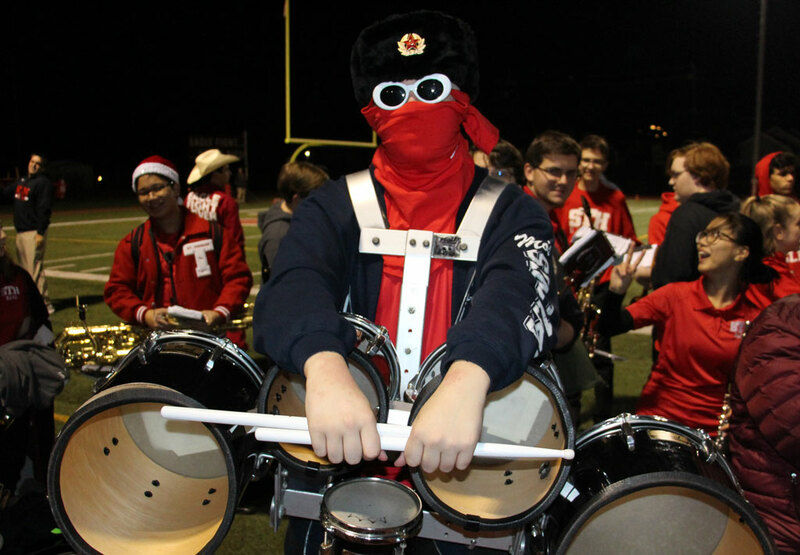 In addition to the tide-turning interceptions from Jenkins and Madden, and the game-altering exploits of Matocha and his merry band of receiving brothers, two-way dynamo Dylan Dixon ‘19 saved his best overall performance for his grand finale at Granger Stadium. Among his myriad of stifling defensive stops was a first quarter end zone defection in a 7-7 game that stymied John Paul and led to a 41-yard field goal try that sailed wide right. 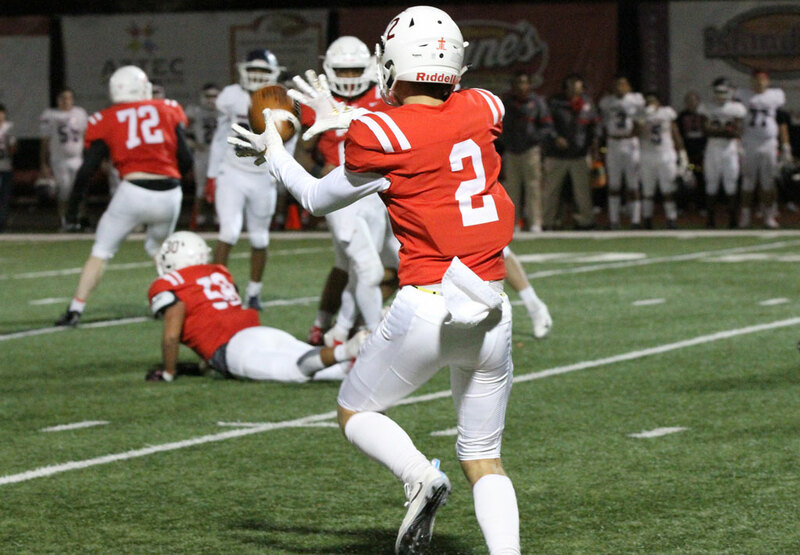 On John Paul’s opening series of the third period, the Houston Touchdown Club Ironman nominee perfectly timed a third-down pass breakup to force a three-and-out punt. 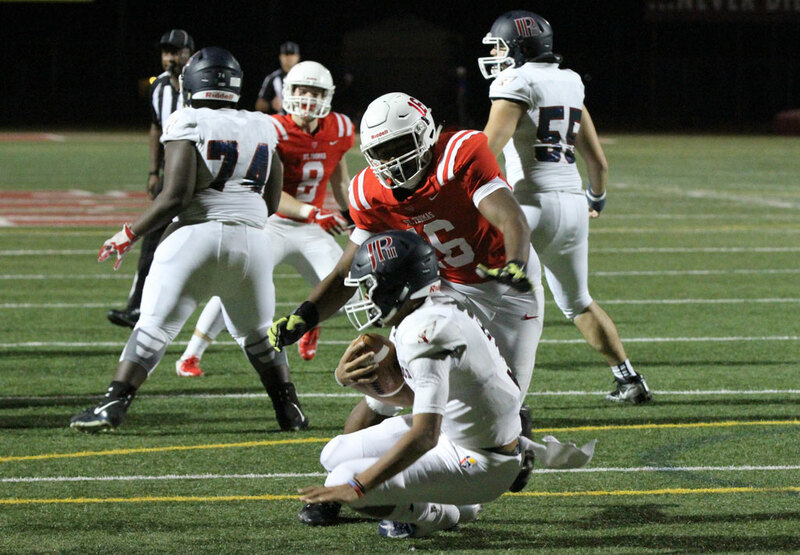 His final stroke of impact was a second late-game victory-sealing takeaway in as many weeks, a steal on a miss-timed late-on-the-out sideline throw that signaled for the visitors to wave a flag to match their all-white uniforms. 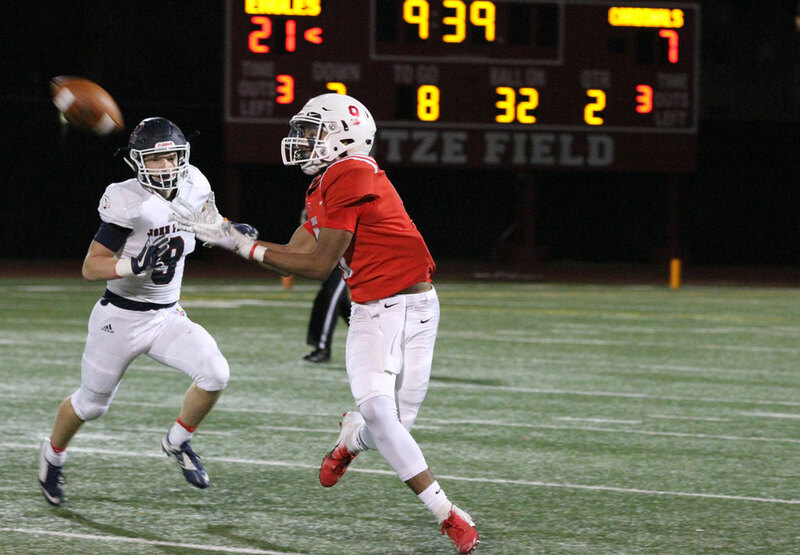 Augustine celebrated his birthday with a bash to remember – seven receptions worth 123 yards with two reservations for six. Early in the second period, he was lonely in the right flat for a grab and then accelerated with an electric cut-back to bolt through the middle of the John Paul defense. The 67-yard pitch-and-catch touchdown moved the Eagles in front 28-7. 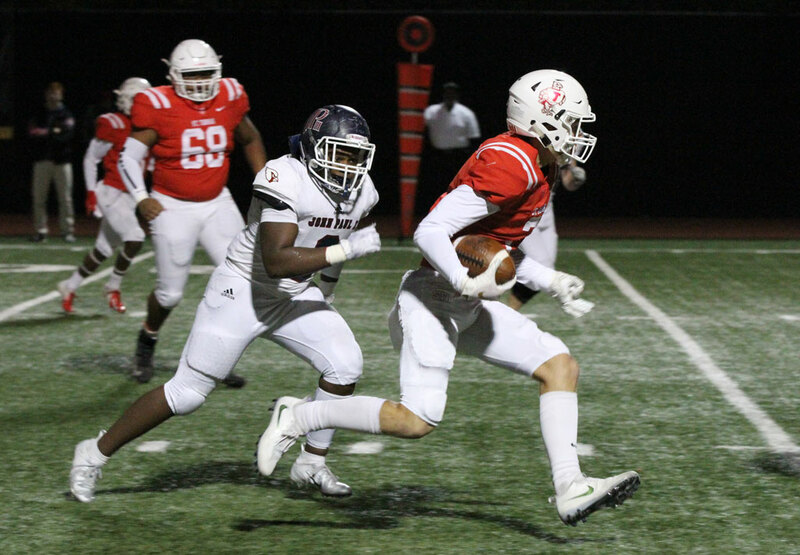 Late third quarter Augustine leaked past the JPII secondary on a deep third-and-15 throw that drew pass interference at the brink of the end zone. 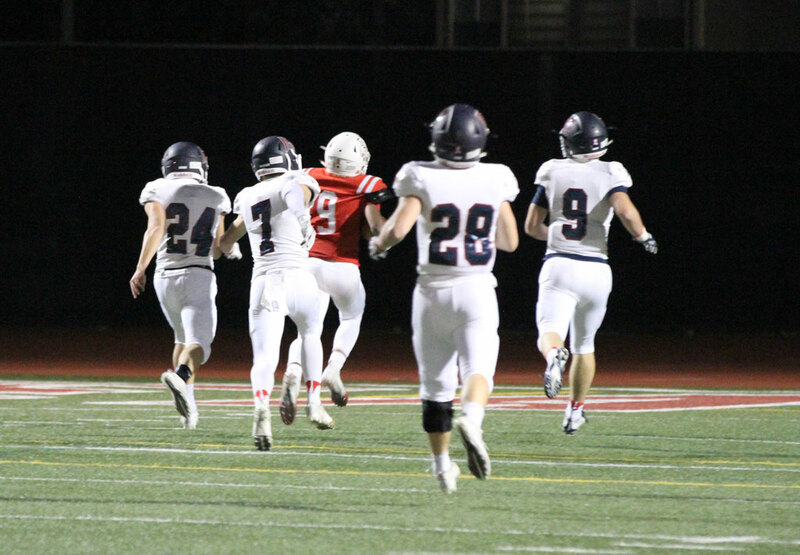 The drive stalled but kicker Paul Langemeier ‘20 split the uprights from 25 yards to increase the count to 45-25. 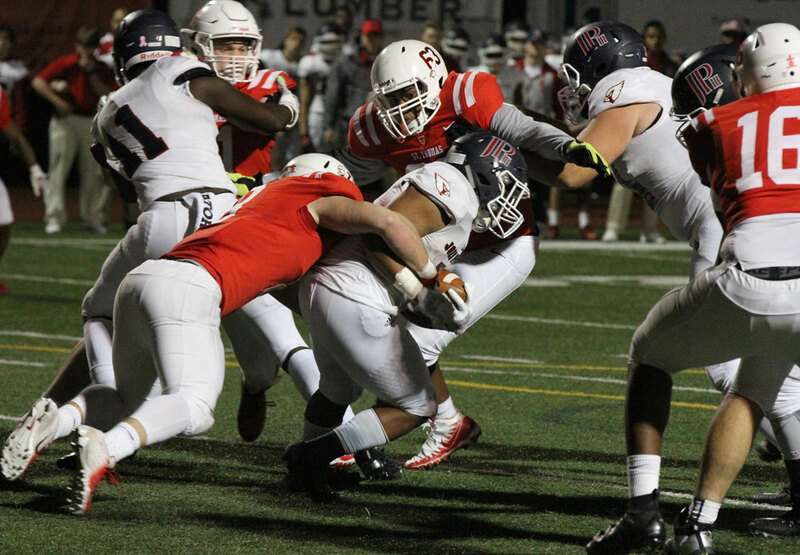 Augustine was also utilized in a goal line defensive package in the first half with Matocha who knocked down a third-down attempt from inside the 10-yard line. 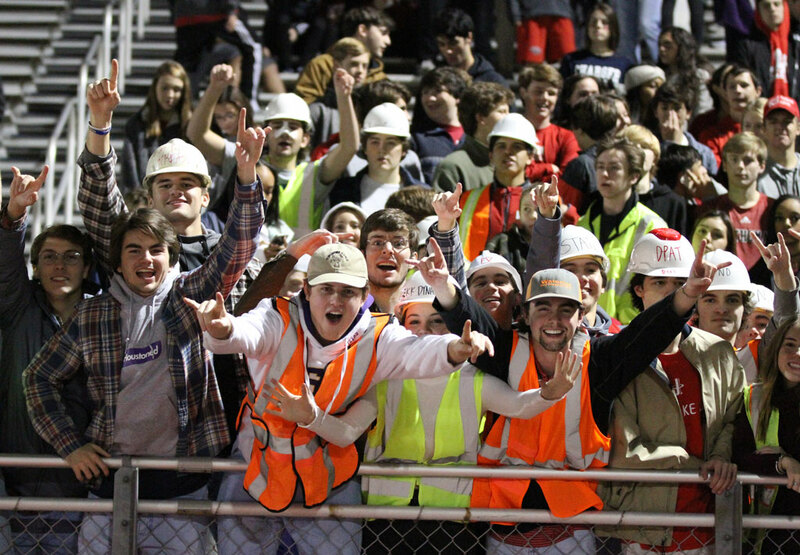 The Cardinals settled for the field goal and Eagle Football maintained a reasonable if not resounding 35-17 cushion. “Jordan is a really special sophomore contributor and I’m not sure he knows how good he can be. He showed speed tonight and just catches every ball. A really unique talent. The Eagles next collide with a Bishop Lynch outfit that defeated Midland Christian 35-15 after leading 21-0 at halftime. The Friars have lost four games this season – all by eight points or fewer. 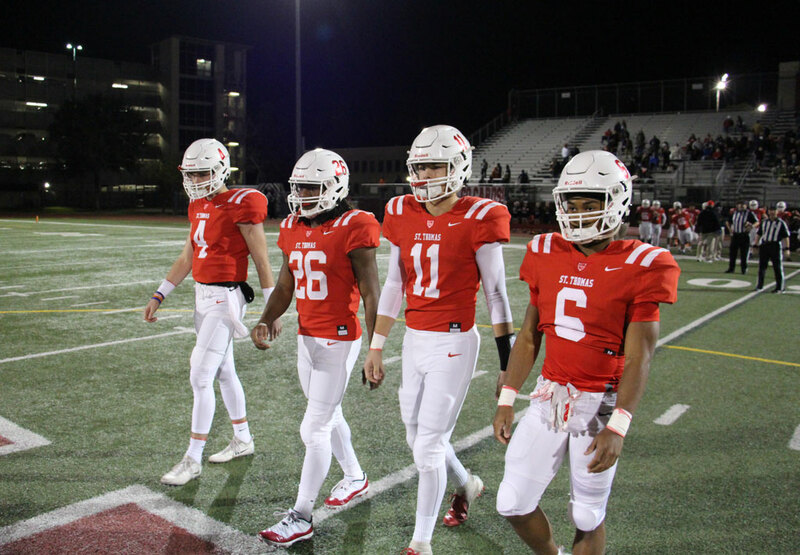 This is the fourth meeting between the two programs in seven playoff seasons. 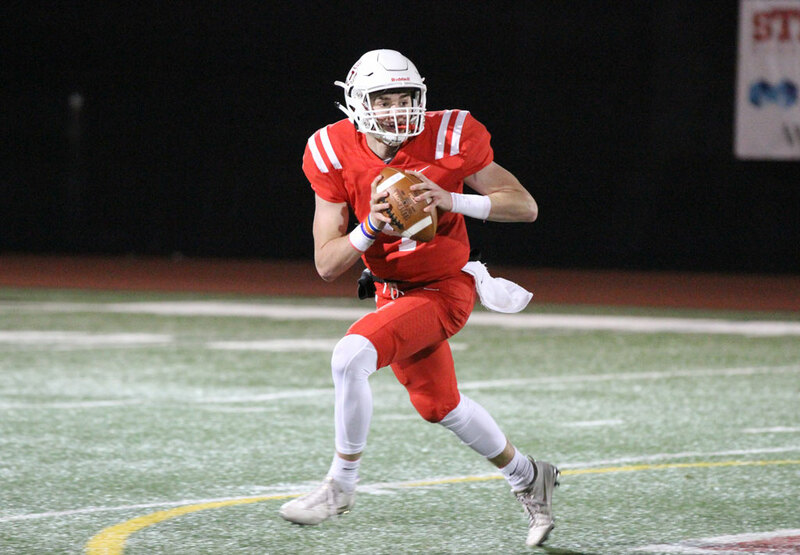 In 2015 Matocha tossed two first-half touchdown passes in his postseason debut but Eagle Football couldn’t maintain the mojo and fell to the eventual state champions to snap a five-game postseason win streak at home. 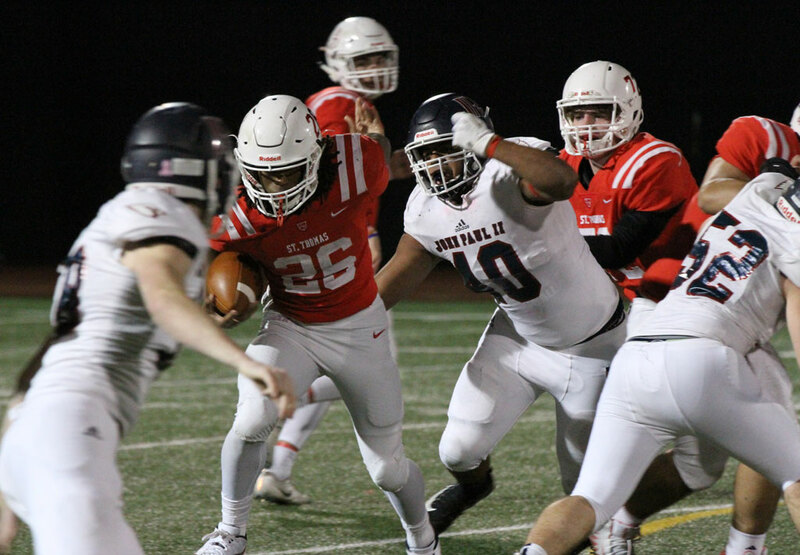 The knockout was its earliest playoff elimination since 2010 after three appearances in the TAPPS state semifinals in five seasons. 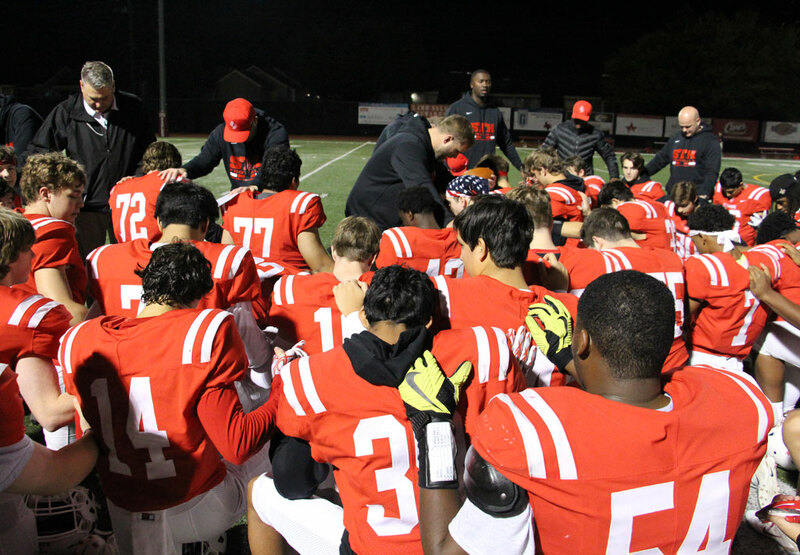 St. Thomas was also defeated by BL 21-17 in Teague in the 2012 Area playoff but then rallied to blitz the Friars 47-28 the following year at Hotze Field inside Granger Stadium. 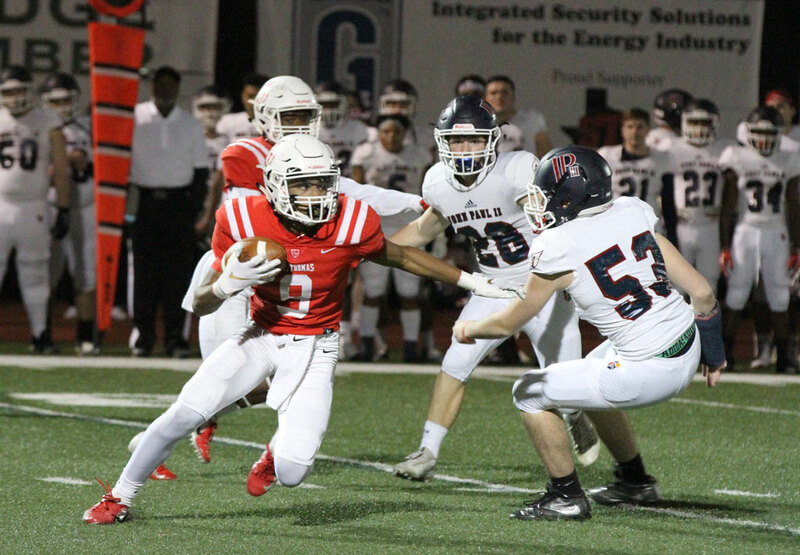 Since wobbling out of September with a 1-4 record Eagle Football has embraced an all-hands-on-deck mentality while discovering relentlessness is a not a trait with an on-off switch. The latest verdict wasn’t pretty but it was pretty emphatic. It was far from perfect but it was perfectly clear. The Eagles don’t care how it looks. They only care that they keep winning.